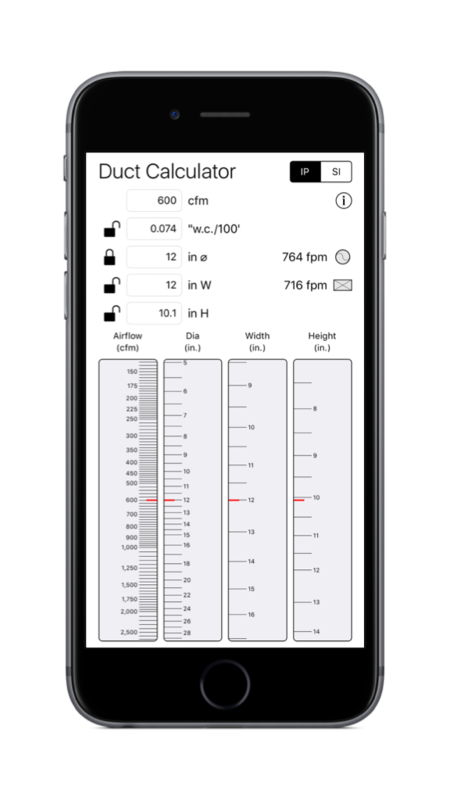 The Duct Calculator App for iPhone/iPad is a modern take on a the classic duct sizing wheel, allowing you to to quickly and accurately size a new duct or calculate the performance of an existing duct on your iOS devices. Size both round and rectangular ductwork with the ease of a traditional Ductulator. Adjust the airflow, diameter, width or height sliders with your thumbs. Get maximum precision by entering numbers directly into the the calculator. Lock friction rate, diameter or width or height to make the calculations you need for your design. Live update of the calculated values allows you to see the impact of the changes immediately. Outputs velocity for both round and rectangular ducts. Enter the airflow, friction rate or size directly as numbers for maximum precision. Use the airflow and size sliders for quick calculations. Shows live equivalent round/rectangular duct sizes. Specific dimensions can be locked to allow specific what-ifs to be quickly calculated. Works for both IP and SI units. Designed to allow quick calculations anywhere, anytime, it is ideal for the HVAC designer or contractor. Air at standard temperature and pressure.